Joplin South Middle School 900 E. 50th St.
Light the Way 5K is not just your traditional 5K race. This is a run of faith! You’ll do plenty of running but, our event will also incorporate faith obstacles centered on biblical events. Ever wanted to carry a cross, conquer Goliath like David did, or roll the stone away? The race will take place on the cross country course of South Middle School and runners will be released in waves. Racers will receive a t-shirt and custom finisher medal. Don't want to run, no worries, walkers are welcome too. Water and refreshments will be provided for this chip timed event. There will also be a 1 mile fun run. 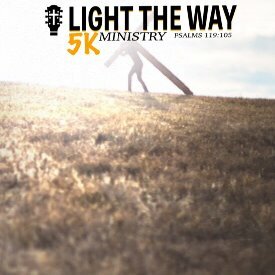 Our race benefits Light the Way Ministry. So join us in our mission of taking church outside the walls and spreading the light of Jesus Christ. Price increase on March 1st to $40.00. Light the Way Ministry is Missouri’s Largest Free Christian Music Festival. We are a 501c3 nonprofit organization that provides the highest caliber of Christian entertainment and value for our audience. At our Stockton, MO location we had over 9,000 attendees in 2017 and over 20,000 in 2018. We are greatly anticipating our third year of the festival and expect the attendance to double again with our move to Rogersville, MO in 2019!